The court shall be a rectangle, 78 feet (23.77 m) long and, for singles matches, 27 feet (8.23 m) wide. The dimensions of the singles court. 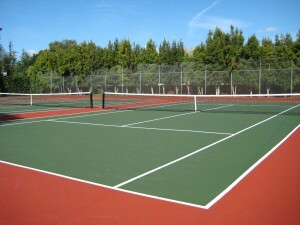 For doubles matches, the court shall be 36 feet (10.97 m) wide. The dimensions of the doubles court. The court shall be divided across the middle by a net suspended by a cord or metal cable which shall pass over or be attached to two net posts at a height of 3 ½ feet (1.07 m). The net shall be fully extended so that it completely fills the space between the two net posts and it must be of sufficiently small mesh to ensure that a ball cannot pass through it. No space between net post and net. The height of the net shall be 3 feet (0.914 m) at the center, where it shall be held down tightly by a strap. The height of the net is 3 feet (0.914 m) at the center. A band shall cover the cord or metal cable and the top of the net. The strap and band shall be completely white. The band cover the net cord. Often called the net tape. Maximum diameter of the net cord. The maximum width of the strap shall be 2 inches (5 cm). • The band shall be between 2 inches (5 cm) and 2 ½ inches (6.35 cm) deep on each side. Maximum width of the net strap. 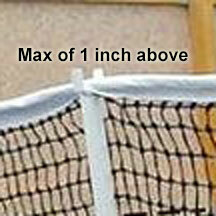 For doubles matches, the centers of the net posts shall be 3 feet (0.914 m) outside the doubles court on each side. Distance of net post from doubles court. 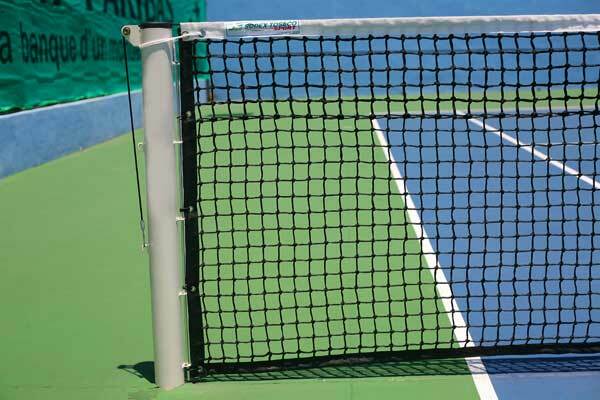 For singles matches, if a singles net is used, the centers of the net posts shall be 3 feet (0.914 m) outside the singles court on each side. 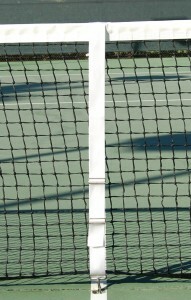 An example of singles net posts 3 feet from the singles sideline. If a doubles net is used, then the net shall be supported, at a height of 3 ½ feet (1.07 m), by two singles sticks, the centers of which shall be 3 feet (0.914 m) outside the singles court on each side. Singles stick distance from singles sideline. Maximum diameter of the net post. Singles stick have a maximum width of 3 inches. Singles stick and net post can only be i inch above the net. Diagram of the baseline on both sides of the court. and the lines at the sides of the court are called sidelines. Diagram of the singles sideline on both sides of the court. Two lines shall be drawn between the singles sidelines, 21 feet (6.40 m) from each side of the net, parallel with the net. These lines are called the service lines. Diagram of the service line on both sides of the court. On each side of the net, the area between the service line and the net shall be divided into two equal parts, the service courts, by the center service line. Diagram of the center service line on both sides of the court. The center service line shall be drawn parallel with the singles sidelines and half way between them. Diagram of the center mark, some times called the hash mark. 4 inches (10 cm) in length, which shall be drawn inside the court and parallel with the singles sidelines. The centre serviceline and centre mark shall be 2 inches (5 cm) wide. Dimensions of the center mark. 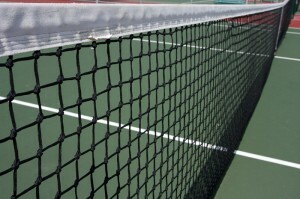 The other lines of the court shall be between 1 inch (2.5 cm) and 2 inches (5 cm) wide except that the baselines may be up to 4 inches (10 cm) wide. 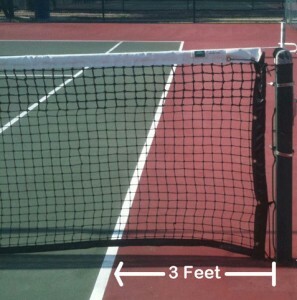 Dimensions of the tennis court lines. All court measurements shall be made to the outside of the lines and all lines of the court shall be of the same color clearly contrasting with the color of the surface. Line colors need to contrast with the court. Generally the in bounds part of the court will be a different color from the out of bounds part of the court.